“I have seldom heard a train go by and not wished I was on it.” -Paul Theroux. (5 Scenic Train Journeys Around The World) Train journeys are often very enriching—presenting a lively picture of cities, villages, meadows, rivers, animals etc. However, some train routes are specifically known for their scenic beauty. In fact, we can enjoy every bit of Nature while on these routes. The most beautiful part of train journeys is the wonderful scenery. So, what are we waiting for? Let us get on board to know about some of such scenic train journeys around the world! At number 1 in our list of Scenic train journeys around the world is the Bernina Express. Switzerland is known for its natural beauty and its train networks are a perfect way explore this beauty. In fact, while talking about Bernina, it gives us wonderful experience altogether. In fact, it stretches from Davos in Switzerland to Tirano in Italy. The train passes through Bernina pass—7000 feet high. Through Vista windows, you can enjoy the spectacular scenery of waterfalls. By the same token, the glaciers of Swiss Alps with Swiss Chocolate is, in fact, visible. The route has 55 tunnels and 196 bridges. Simply wonderful, isn’t it? Rocky Mountaineer is the company that runs the train with the same name. 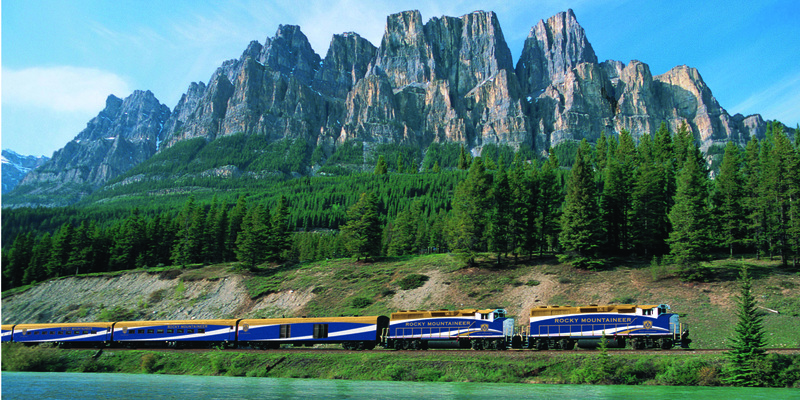 In the first place, it is a two-day journey full of natural scenery through the Canadian Rockies. Moreover, Green forests, rivers, lakes, and wildlife will make your journey amazing by the time it finally ends in Vancouver. The train runs along four routes over Old Canadian Pacific Line in the daytime, allowing best views. Hence, it is at number 2 in our list of Scenic train journeys around the world. From the city of Christchurch to Greymouth this train is one of the best-known trains for breathtaking scenery. Along the Waimakariri river and through the Southern Alps passes through 16 tunnels and 4 viaduct bridges. The nearly 5-hour journey (one-way) is a part of part of their ‘Great Journeys of New Zealand’. As a matter of fact, the train operates once daily and if you like you can make a round trip. A Swiss train again, this is equally a perfect way to explore Swiss Alps. Connecting two famous ski resort cities of St. Moritz and Zermatt, the train is the slowest in the Europe. Through 291 bridges 91 tunnels, this is one of the most uniquely beautiful train rides in the world. Furthermore, in the eight-hour journey, you can enjoy snowy peaks, green forests and Swiss Alps. From Fort William to Mallaig, this route has a famous Harry Potter location—the 21 arch Glenfinnan Viaduct. The train named ‘Jacobite’ is a steam-powered train and is the Hogwarts Express of Harry Potter. The 41-mile journey through Green woodlands, sea views, sunsets is one of the most beautiful scenic train journeys.